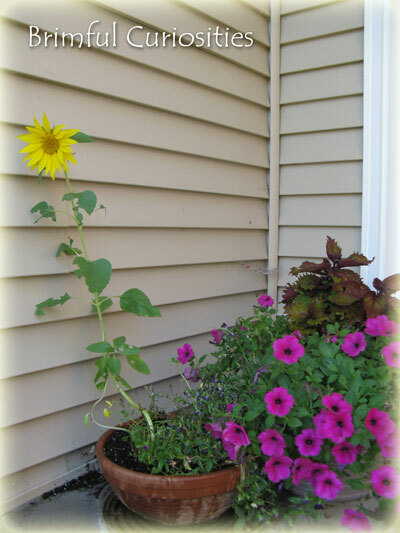 A sunflower I didn't plant in my flower pot. Guess our friendly chipmunk neighbor thought I needed a little more happiness in my life. Either that or he's trying to apologize for being such a little stinker. All that dirt alongside the pot -- that's his handy work. That is cute! What a fun surprise! Yeah- what an wonderful surprise. I just adore sunflowers. Happy WW! Thanks for visiting today and taking a peek at my little man in the box! ps. I'm not sure of the book you mentioned. What is the title? It sounds cute. I had a stray sunflower last year and quite enjoyed my surprise as well! They are such a happy flower! Happy WW! What a fun surprise. That color goes nicely there. Such a beautiful surprise! Love it. Gotta love those unexpected gifts. That's a cool surprise. It's good that you didn't pull it up thinking it was a weed when it was a baby. In Lincoln, NE an hour from me I found out that there's a store that has corn growing all in front of it. They didn't plant it. Crazy! That is a nice surprise. Sometimes birds will drop them too.